POP princess Ariana Grande has made a defiant return to the stage in Manchester to screaming crowds, less than two weeks since her dream show turned into a nightmare. The 23-year-old was wearing a One Love Manchester jumper and sang her songs Be Alright and Breakfree half way through the concert. The US singer got emotional as pink streamers flooded the crowd and cheering rung through Manchester for their brave idol. Minutes silence at One Love concert: Crowds hold a minutes silence followed by incredible cheer at Ariana Grande concert. She then performed a duet with US band The Black Eyed Peas of their epic hit Where Is The Love. The fitting single, which was the best-selling song of 2003, was written by the popular group after the September 11 bombings in New York, and portrays issues surrounding terrorism and discrimination. It was a touching tribute and a favourite moment among the crowd members, who were seen crying and preaching the song's influential lyrics. Grande was in tears during the poignant performance. Will I Am took the opportunity to praise the efforts of emergency services and the brave people of London and Manchester. Grande's manager and co-organiser of the event Scooter Braun addressed the crowd in a powerful speech commending the audience for showing up after the London attack. "We want to thank you all for joining us," Mr Braun said. "To my friend Ariana Grande and the entire Dangerous Woman crew, myself and all of us around the world are so grateful for you for stepping up and taking action. "Last night this nation was challenged and you had a decision whether you were going to come out here tonight, and you all looked fear in the face and said no we are Manchester. "Hatred will never win and fear will never divide us." Former One Direction heart throb Niall Horan, rocked by the recent events in the UK, sang his solo songs Slow Hands and This Town. "I've been lucky enough to travel all over the world and every time I come to Manchester I'm addicted to this place. "You make everyone from out of town feel welcome. "We love you, we're with you." Marcus Mumford of British-American band Mumford and Sons started the show with a minute silence, before performing the group's beautiful song Timshel, setting the bar for what is sure to be a musical message of unity and love. Manchester's most successful musical exports Take That followed Marcus' stunning acoustic ballad with their upbeat 2006 hit Shine. The English pop music group, who formed in 1990, were joined on stage by former member Robbie Williams hugged the pop trio at the end of their set. Take That got the audience dancing as Gary Barlow, Howard Donald and Mark Owen, hit the stage to a roaring crowd. They then rocked the crowd with their newest song Giants, released in February this year. "Everyone has been affected by this but right now we want to stand strong and sing loud and proud," Barlow said, before breaking out in their touching song Rule The World. When Williams took to the stage he hit his set off with his tribute song Strong. The 43-year-old changed the chorus lyrics to his original 1998 song, singing "Manchester we're strong, we're strong, we're still singing our songs." The lyrics flashed on the big screen with up to 50,000 people's voices ringing through the words across the grounds. He followed the powerful tribute with one of his most popular songs, his 1997 smash Angels. Williams was visibly emotional as he struggled to string the touching lyrics together, blowing a kiss to the sky for the 22 people killed at Grande's concert nearly two weeks ago. American singer-songwriter Pharrell Williams got the crowd on their feet after an emotional set by Robbie, playing his catchy tune Get Lucky. He surprised fans by performing a duet with former Disney star Miley Cyrus to his biggest chart-topper Happy. "Despite all the things going on in this place I don't feel or see or smell any fear in this building," Williams said. "All we feel here tonight is love, resilience, positivity." Cyrus picked up his set with an emotional performance of her new song Inspired. "The most important responsibility we have on this earth is to take care of one another. "And look what we're doing tonight." "Welcome to the biggest gig in the world." That was the message plastered across big screens at start of the concert. 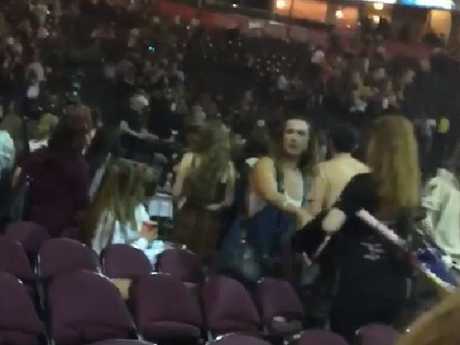 Survivors of the Manchester Arena attack, which saw 22 innocent people die at the hands of suicide bomber Salman Abedi, have been greeted by roaring applause and a guard of honour on their way to the benefit concert. Cheers and clapping broke out on the main road of Old Trafford Cricket ground as thousands of Mancunians formed a guard of honour for the victims and their families. One Love Manchester will star Justin Bieber, Katy Perry, Miley Cyrus, Niall Horan, Take That, Usher, Robbie Williams and Little Mix, among a bevy of other big names. Cyrus has taken to Twitter to post a photo from the venue with the hashtag #WeStandTogether, while Perrie Edwards of Little Mix uploaded a shot of her backstage getting ready for the gig. Hours before the big concert at Manchester's Old Trafford cricket ground, Take That singer Gary Barlow shared a snap of Grande with his boy band backstage. All proceeds will be donated to the victims of the Manchester bombing at Grande's concert on May 22. Fans have begun queuing outside the entertainment venue as hundreds of police patrol the area, forming an impenetrable ring of steel. The concert will raise money for the victims of a suicide bombing that struck at the end of Grande's last show nearly two weeks ago. It comes a day after attackers targeted the heart of London, killing seven people. Authorities have said the attack started with a van ploughing into pedestrians and then involved three men using large knives to attack people in bars and restaurants at a nearby market. Grande's manager Scooter Braun said on Sunday that the concert would go on as planned. He called the event a "statement that hatred and fear will never win." "Today's One Love Manchester benefit concert will not only continue, but will do so with greater purpose," Braun said in a statement. "We must not be afraid and in tribute to all those affected here and around the world, we will bring our voices together and sing loudly." A star-studded show is being broadcast across the globe and proceeds will go to an emergency fund set up by the city of Manchester and the British Red Cross. The May 22 attack at Grande's Manchester concert killed 22 and wounded dozens more. 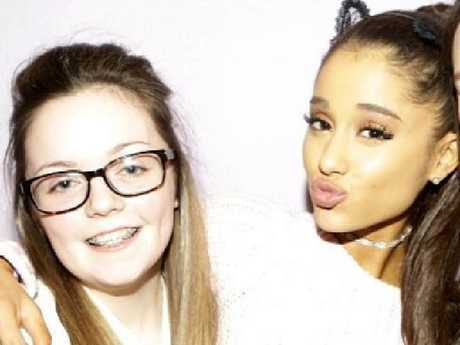 The pop singer visited young fans injured in the attack at the Royal Manchester Children's Hospital on Friday. "We will not quit or operate in fear. We won't let this divide us. We won't let hate win," Grande wrote in a statement when she announced the benefit concert last week. "Our response to this violence must be to come closer together, to help each other, to love more, to sing louder and to live more kindly and generously than we did before." Bieber quit tour to set up his own church?